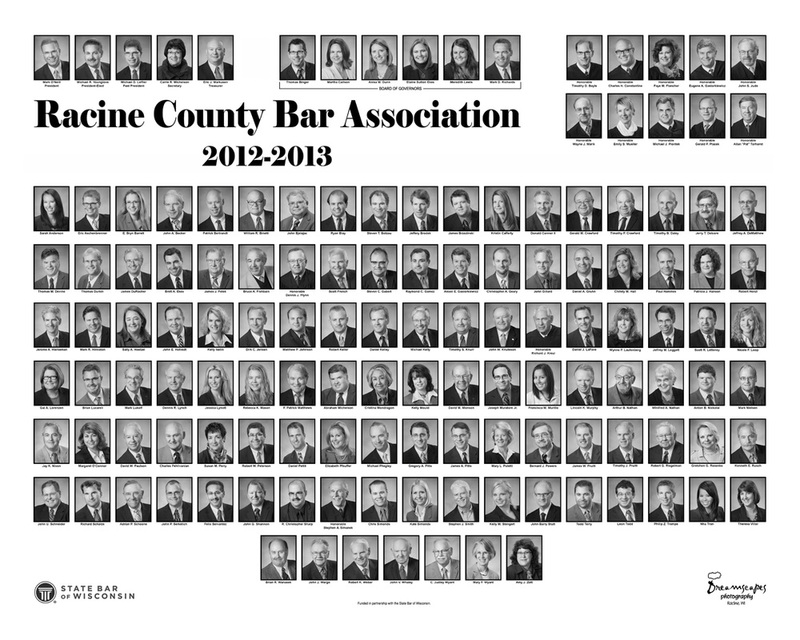 ​In 2011, the State Bar of Wisconsin approved a grant request of the Racine County Bar Association to develop a section entitled, History of the Racine County Bar Association, on its website. As part of this project, the bar association created the history page, photographed and uploaded bar member murals hanging in the courthouse, scanned and uploaded memorials of deceased members, and scanned and uploaded other historical documents. 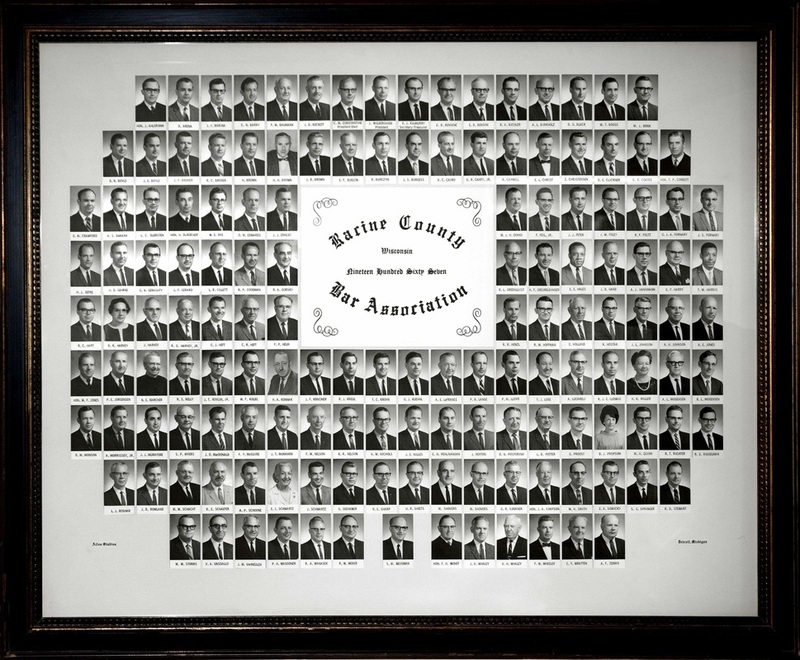 The effort was undertaken to preserve the rich history of the bar association and its membership, which includes many current and former judges, and to publish it. To know oneself is to perceive truth and to be challenged. Institutions for better or worse are affected by the past. Historical understanding can add to a better appreciation of the present and perhaps even give some insight toward the future. It was with that in mind that a decision was made, in June 1986, to study and report on the history of the dispute resolution system for Racine County. This study was undertaken by the Hon. Dennis J. Flynn and Attorney Susan M. Perry. The original written report was first updated in 1996, and then updated again by the Racine County Bar President Michael D. Leffler in 2012, for what was written then is true today- but there is more of it. In the original report, it was stated, "Present and future interest and readership may be limited. However, utility is felt to exist and the task, if it is to be done, is more do-able now than some decades hence." Research recognition and appreciation continues to be extended to Robert Rettammel, who was a senior intern at the University of Wisconsin-Parkside in 1985-1986, the Racine County Historical Museum, the Court archives made available through the Clerk of Courts and the County Clerk, the files of the Racine Journal Times, the library at the University of Wisconsin-Parkside, the Racine Public Library, William H. Honrath and Jim Zimmerman who, as an intern with the Racine Court system, helped with the 1996 updating of the study. 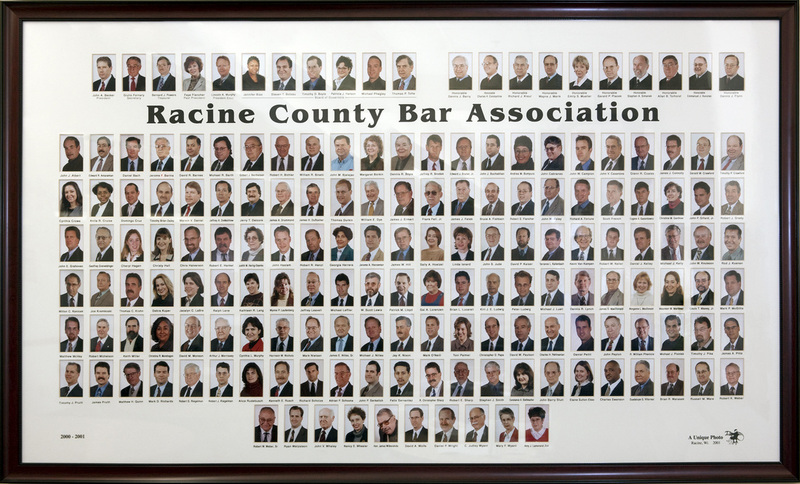 Under the direction of Michael D.Leffler, the bar association’s historical documents and the dispute resolution study were put into a format on the Racine County Bar Association website which will assist future updates and make the documents and study available to the Racine County Bar Association membership, the Citizens of Racine County, and the public at large for generations. A special thank you goes to past RCBA President William Bennetti. He assisted with organizing and scanning the bar member memorials and bar roll call book. The history of the dispute resolution system document is divided into three basic areas. Focus will first concern an analysis of the evolution of the system that has dispensed justice to our citizens. This section is titled, Steps in the Development of the Court System in Racine County. This examination covers the period from approximately 1790, when Racine County formally did not exist and was instead a part of the Northwest Territory, to the present (2012). The second portion of inquiry will relate to the human dimension of the justice system. This section is tilted, Evolution of Racine County’s Justice System. The third portion identifies the current and former judges of Racine County. This section is titled, Biographical Sketches of the Judges Who Have Served Racine County from 1824 to 2012. To date, judicial stewardship in Racine County has been shared by 63 judges. Their stories, in historical context, may give the reader a better sense of the system's energy, commitment and efforts than would a mere summary of only historical facts concerning Racine's judicial branch of government. ​Finally, the information contained in the history of the bar association section on the bar’s website continues to be threshold in nature. The passage of time coupled with additional research, documentation and citizen input will, probably, lead to refinements and supplementation to that which is here stated. As with Thucydides, the first chronicler of human activity, your authors recognize that history lives always through present tense insights. THE DEVELOPMENT OF THE RACINE COUNTY COURT SYSTEM. ​A. Justice of Peace system from 1790 to 1824 under authority of British military and Michigan and Indiana governors. B. One Federal Judge in Northwest Territory (1824-1836). C. Three Judge Territorial Supreme Court (1836-1848). D. Five Circuit Courts making up both trial and appellate Court system for all of Wisconsin. The 5 Judges who presided over the circuit courts were to meet at least once a year at Madison as a "Supreme Court" until the legislature established a separate court. Racine County was a part of Circuit #1 (1848-1853). E. Wisconsin Supreme Court (3 Justices) began in l853 (5 Justices) in 1877 and (7 Justices) in 1903. F. Wisconsin Court of Appeals created in 1978. In 1996 it has 16 members (1978-1996). G. One Judge Territorial Probate Court (1838-1848). H. One Judge Wisconsin Probate Court (1848-1850). I. Circuit Courts. Initially there were 6 Circuit Judges for Wisconsin. In 1994 there were 224 Circuit Judges. Racine has 10 Circuit Judges-the 10th branch began l August 1994. (1848-1996). J. County Courts. These Courts absorbed and for awhile ran parallel to the Probate Court system (1850-1978). K. Municipal Courts. This system began in 1887 and Racine had, over time, 6 Municipal Court Judges when this system merged into the County Court System in 1962. It continues now, with restricted jurisdiction, in some of this county's cities, villages and towns. The County has two cities, seven villages, and nine towns (1897-2012). Click here to download a PDF file detailing the formation of Racine's justice system prior to statehood. Click here to download a PDF file detailing the formation of Racine's justice system following statehood. Click here to download a PDF file for judges who served Racine County from 1824 to 2012. Click here to download a PDF file for judges who served Racine County from 2012 to Present. The Call of the Calendar ceremony is the evolution of the Racine County Bar Association's long standing Memorial services. Traditionally the Bar has paid tribute to its deceased members with a Memorial service conducted before the presiding chief judge of the circuit court. These Memorial proceedings have somewhat been preserved on the circuit court records and on filed written documents. Many of the records have been lost over the years. The original Call of the Calendar was more a pretrial conference. The civil court judge would have a calendar published for his spring and fall terms. Usually trials were not scheduled during the summer months. All the attorneys with cases pending in that judge's court would be called to his court to a pretrial conference. The trial calendars back during these times was not as voluminous as it is nowadays. Often times younger associates were sent to cover the conference. This occasion lent itself to an informal gathering of lawyers and often new associates would be have the opportunity to meet some of the other established lawyers. This procedure was discontinued in Racine in the mid 1970's. In 1997 the Bar Association decided to expand the Memorial services to include the introduction of new members of the Bar. New members are administered an Oath and then invited to sign the Roll. This combined ceremony was renamed The Call of The Calendar. The following entries contain copies of memorial eulogies and accompanying court papers which show a rich tradition of honoring deceased members of the Racine County Bar Association. These documents dating back to 1905 contain a great deal of Racine County history. They are very eloquently written records of the lives and struggles of people from that era. The character, integrity and grace of the legal profession is colorfully portrayed and preserved by the written words of these past lawyers. 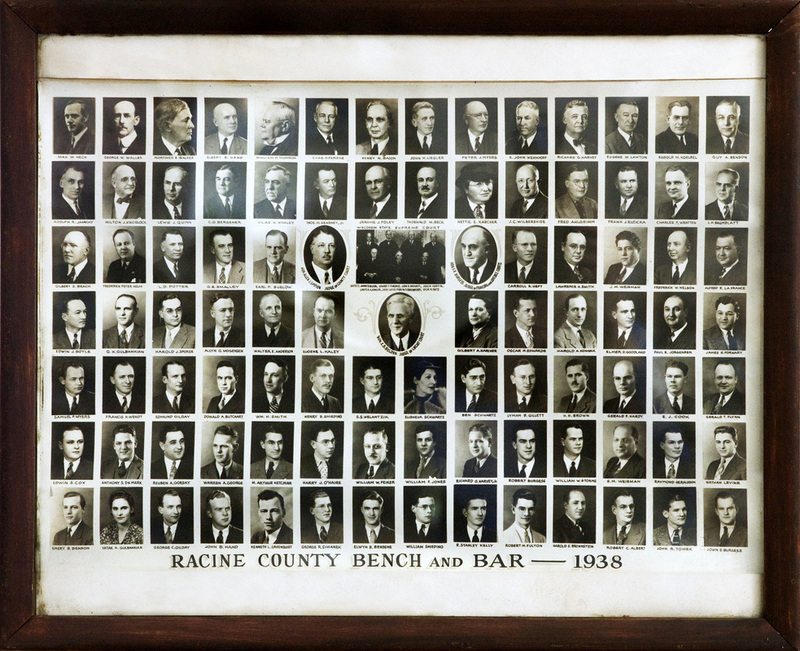 J. LESTER JOHNSON, RICHARD G. HARVEY, JR.
1905.pdfThe Racine County Bar Association thanks the State Bar of Wisconsin for partially funding the History of the Bar project through its Member Services Grant Program.